Yesterday we reported that there was going to be a release of the classic Star Trek Enterprise, as well as a Mirror, Mirror Enterprise. Come July, we will also see the release of an Enterprise based on its appearance in classic film Star Trek 2: Wrath of Khan. This superb U.S.S. 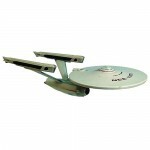 Enterprise measures 16-inches long and features light and sound effects. From the popular Star Trek: The Wrath of Khan movie, this impressive plastic version of the Enterprise sports an all-new paint scheme, too. This legendary vessel is now ready to leave dry dock and explore your collection. Make it so! What is the differance between this one and the one released last year for ST 2?